Bake cake according to instructions. You can also use a round spring form pan and slice the cake in half. In a bowl, combine fresh cream, castor sugar, on high-speed until stiff peaks form. Use a spatula to spread a thin layer of whipped cream over one of the cake layers. Slice about 7 strawberries and scatter evenly over the whipped cream. Spread another layer of whipped cream over the strawberries and then place the second cake layer on top. Use remaining whipped cream to spread over the sides of the cake until the whole cake is coated with a thin layer. 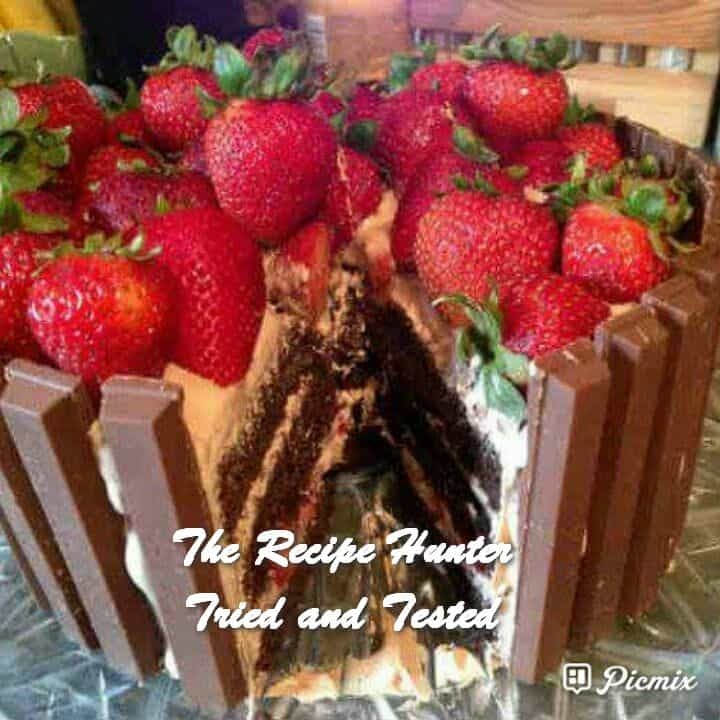 Press and line the entire outside rim of the cake with Kit Kat bars then fill up the top of the cake with fresh strawberries. In a small saucepan, heat the strawberry jam with 2 tbsp of water until thickened and bubbly. Strain out the strawberry pieces and brush the strawberries with glaze. Keep cake refrigerated as the fresh cream needs to stay cold.